The sea view from the 7th floor was amazing! Every morning was a delight, watching the sun and the sea while taking the first (complimentary) coffee. Strolling on the beach? No problem, it took only 3 minutes to reach the sand and smell the Mediteraneean. Oh, and don't forget the small pool at the 5th floor, cold enough to take a bath in April, but cozy enought to have a drink on the deck, while watching the sunset. Room was perfect for our family of 4 and we could have gotten 1 or 2 more in the room if needed. The staff was super friendly and helpful with the local travel and transportation. You can be on the in 3 minute walk. Our stay in Lugaris Business Apartment was excellent, all the staff at the reception were very helpful. The property was maintained to a very high standard and the view from the apartment was great. This is our 3rd year in Lugaris and we plan to come back to Lugaris next year as well. The location of the apartment is great for a family with a young child- loads of playground nearby, excellent cafe's and restaurant, 1-minute walk to the beach and supermarkets. The Rambla de Poblenou offers great options for restaurants and cafes. The view was fantastic and the room was very spacious and nicely appointed. The neighborhood was wonderful to explore. The staff was very nice and friendly especially Eva who was super nice and helpful! This place is spotless,. Great place to stay with the family. We traveled with our 3 kids (13, 11, 8) and had more than enough room for all of us. Great location...5 minute walk to Metro, Hop on hop off bus and a block from the beach. Great restaurants very close too. Supermarket 2 blocks away so it was easy to make breakfast everyday. Staff was amazing! Couldn't have helped us more. Less than a 15 minute Metro ride into the heart of the city...so you have the beach and the city experience. You will like the location - for families, the apartment is big as it gets, staff is great! Close to the beach and staff was extremely helpful and friendly. Lock in a great price for Lugaris Beach – rated 8.8 by recent guests! One of our top picks in Barcelona.Lugaris Beach is located less than 650 feet from Bogatell Beach in the quiet neighborhood of Poble Nou. 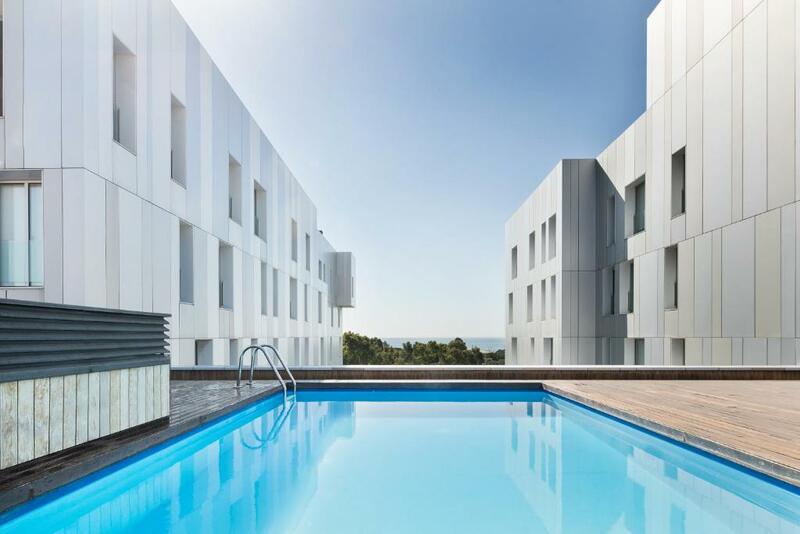 The Lugaris Beach apartments feature contemporary design, floor-to-ceiling windows and free high-speed internet access. The private kitchen is equipped with an oven, Nespresso machine, and fridge. Each apartment also has a living room, flat-screen TV with international channels and washer-dryer. A welcome pack with basics such as coffee, tea, milk, sugar, salt and oil is included. Facilities at the Lugaris Beach include a tour desk, babysitting and shuttle service, which is available upon request and for an additional cost. Bed linen and towels are provided and guests can make use of car and bike rental. Parking is available at an extra charge and beach towels can also be rented. 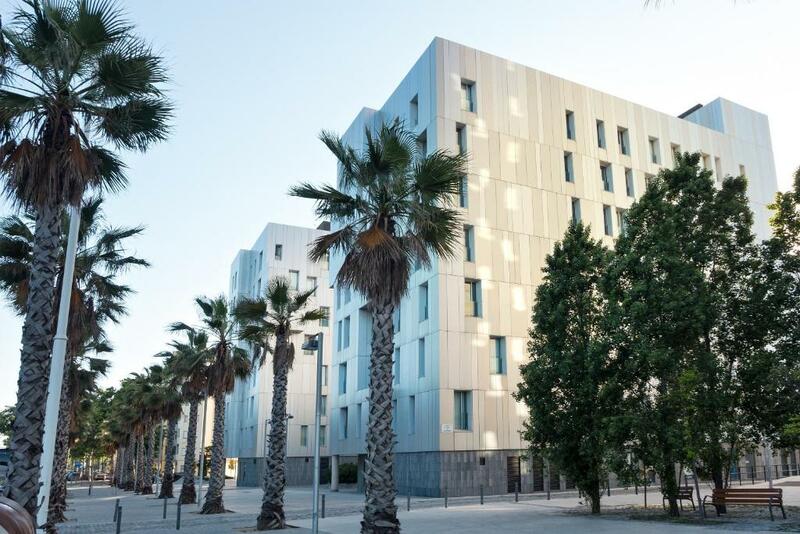 The apartments are a 5-minute walk from Poblenou Metro Station and 2 minutes’ walk from Poblenou Park. The area offers plenty of bars, restaurants, and a shopping center. Plaza Catalunya and Las Ramblas in central Barcelona can be reached in around 20 minutes by metro. Sant Martí is a great choice for travelers interested in beaches, monuments and city walks. 뀐 Located in the top-rated area in Barcelona, this property has an excellent location score of 9.0! When would you like to stay at Lugaris Beach? This apartment with design furniture features a double bedroom, an open kitchen and sitting area, and a bathroom. Free high-speed Wi-Fi is included. Public parking is available on site (reservation is needed) and costs EUR 20 per day. Featuring a sea view and free Wi-Fi, this apartment with design furniture features a double bedroom, an open kitchen and sitting area, and a bathroom. This apartment has 1 double bedroom, 1 single bed, 1 sofa bed, a living room with open kitchen, and a bathroom. This spacious apartment with design furniture has 1 double bedroom, 1 bedroom with single beds, 2 bathrooms, an open kitchen and seating area with a sofa bed. 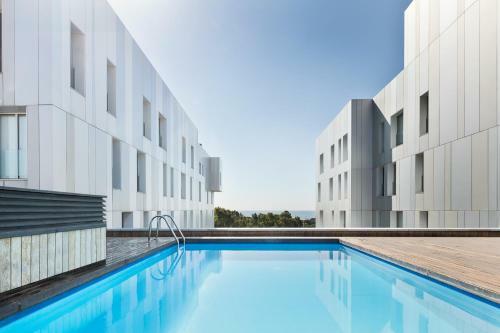 This luxury apartment complex in the area of Sant Marti is situated five minutes walk from Bogatell Beach and Mar Bella Beach. Sagrada Familia and Palau de la Música Catalana are also less than 5 kilometers. 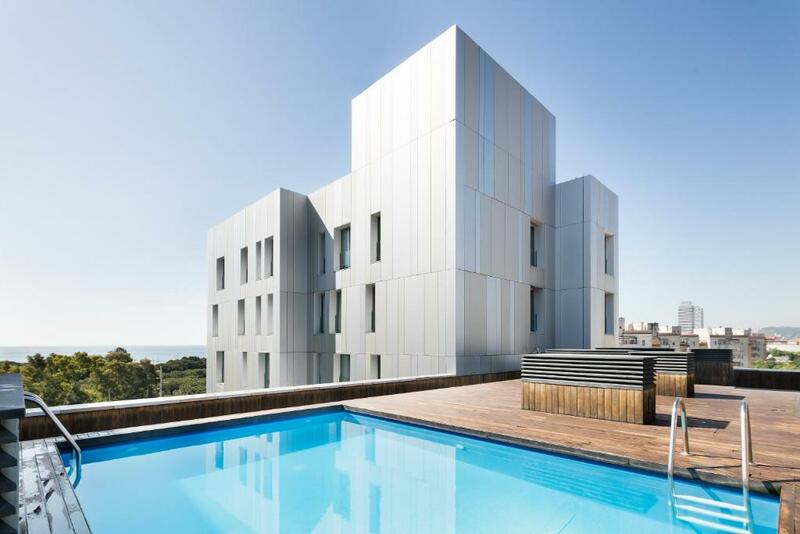 Besides a rooftop terrace, this apartment complex non-smoking has parking and a pool. The wifi in public areas and in the apartments is free. You will also find concierge services, dry cleaning and laundry. The 58 individually decorated apartments with have sofa bed available. The kitchen is equipped with refrigerator, stovetop, microwave and dishwasher. weekly maid service is included. Poblenou: the bohemian neighborhood of Barcelona, where cool is the authentic, simplicity is a maximum. Located a few minutes (5 metro stops on the yellow line) from the center of Barcelona, staying at Poble Nou is a great option, if you visit Barcelona. Near the new business district 22 @ and minutes from the Mediterranean Sea, the Poble Nou district offers you the chance to enjoy the beach and the park which separates it from the city; to stroll through the charming Rambla with many bars and restaurants to enjoy the cuisine and neighborhood atmosphere. A place to contemplate the splendid appearance of old restored factories and where to discover beautiful places like the Plaza Prim. Area Info – This neighborhood is a great choice for travelers interested in beaches, monuments and city walks – Check location Excellent location – show map Guests loved walking around the neighborhood! House Rules Lugaris Beach takes special requests – add in the next step! Lugaris Beach accepts these cards and reserves the right to temporarily hold an amount prior to arrival. Please note that late check-in after 00:00 carries a EUR 50 surcharge. A damage deposit of EUR 200 is required on arrival. That's about 224.87USD. This will be collected by credit card. You should be reimbursed on check-out. Your deposit will be refunded in full by credit card, subject to an inspection of the property. Please inform Lugaris Beach of your expected arrival time in advance. You can use the Special Requests box when booking, or contact the property directly using the contact details in your confirmation. The rooms were clean, spacious and almost felt luxurious. For the cost of the rooms we felt they were brilliant value for money and comfortably slept our large party! Two twin beds would have given more flexibility than a double. Sofa beds not comfortable. Not enough electrical outlets. Quality of cookware. Things were great. Daily cleaning would be great bonus. The room was not ready and was missing some blankets! Which is a basic thing to have it ready with the room. And when I requested the blanket I was asked to carry it myself to the room !!! We would rather have duvet cover than those sheets. If there is a phone to communicate with the stuff in the suite. We stayed at the sea view apartment and it was excellent. Well-equipped, quiet, fully conformed to the photos here. The apartment complex is really in 5-minutes-walk from the sea, so it would be perfect for summer holidays. Nice and helpful staff. Highly recommend!